The Great Bend Panthers won their ninth straight game at Redskin Field Friday night. Great Bend beat Liberal 35-6 in a game that was 27-0 at the half. The Panthers won handily but were sloppy in the process committing eight turnovers while the Redskins sputtered offensively with four turnovers and only 140 yards of offense. The game got off to an inauspicious beginning when Malcolm Wiltshire came in at quarterback for the first play but fumbled the carry. Great Bend quarterback Koy Brack capped off a short four play drive with a five yard run for the score. Brack zipped a pass over the top of the Redskin defense to Alex Schremmer for a 50 yard score. Braxton Hyde intercepted a Brack pass for the first of eight turnovers. Great Bend dropped a punt and Pancho Terrazas recovered on the Panther 26. However Liberal missed a 29 yard field goal. Brack found former Liberal resident Dalton Miller for a 10 yard TD pass on fourth down. Hyde intercepted another pass with 4:03 to go. Liberal fumbled it away immediately as Great Bend’s Townsend Kurth recovered the fumble. That led to a 15 yard TD run by Gage Fritz. Great Bend’s Alex Olivas intercepted a pass for Liberal’s third turnover of the half. However, Syris Dunlap blocked a Panther field goal attempt. 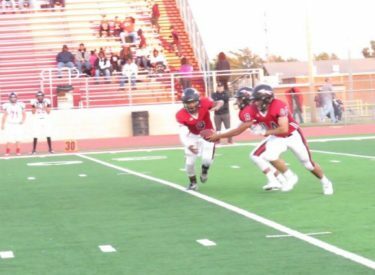 Great Bend fumbled the second half’s opening kick return and Liberal’s Josh Arafol pounced on the fumble at the Great Bend six. However, Liberal only gained one yard on four snaps and did not score. Great Bend used a time consuming drive capped by a Fritz five yard run with a two point conversion to lead 35-0 with 7:33 to play in the third. Elijah McCarter intercepted a pass on Great Bend’s next possession. However, LHS fumbled and committed their fourth turnover. Terrazas tipped Brack pass and Zeth Mansell intercepted it. Miguel Martinez recovered a Great Bend fumble for Great Bend’s eight turnover. Jaylin Staten’s four yard touchdown run gave LHS a touchdown. The two point conversion failed. Great Bend amassed 417 yards which is a season high against Liberal’s defense. They allowed two passing touchdowns and three rushing TD’s. Liberal is 1-6 and has lost six straight. They are 0-3 in the WAC. Great Bend is 5-2 and 3-0 in the WAC. The Redskins host the 4-3 Dodge City Red Demons Friday night at 7 for senior night and Liberal’s final home game. Redskin Pre-game at 6 on 1270 and kscbnews.net.